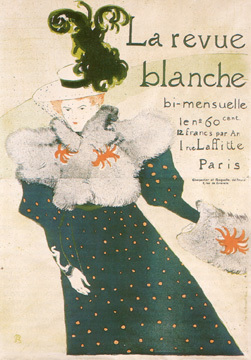 When Toulouse-Lautrec chose to advertise the art and literary magazine La Revue Blanche by using a portrait of Misia Natanson, wife of co-editor Thadée Natanson, it was because the brainy, red-headed beauty was the real mover behind the throne. Her house was the mecca of the literati, and it was she who coaxed some the major celebrities of the day - Catulle Mendès, Paul Valéry, Léon Blum, Octave Mirbeau, Claude Debussy, André Gide, Colette and Toulouse-Lautrec himself - to contribute to the publication's success. The original design for this poster had a small remarque printed at left which made it clear that Misia was being shown skating. In her biography of the artist, Frey writes that "many people feel [this poster] is [Toulouse-Lautrec's] strongest individual work...The strength of this work comes in large part from the fact that, as in many of Henry's posters, the figure is cut off by the lower edge just below the knees...The entire poster is like a little joke, as if Henry were amusing himself by proving that he could show an ice skater without ever showing her skates"